Green Girls opens with Jacob Winter, pseudo-novelist and expert carpenter, waking up in a jail cell. He's told that he assaulted his former psychiatrist and his wife's boss. Jacob recalls some events of the previous night, but no assault. Told that his wife has left his car in front of the police station, packed with his clothes and a sleeping bag, Jacob is baffled. He has no idea how he ended up in jail, why he's not allowed contact with his family, or why Alix Callahan, a former college classmate who never spoke to Jacob, has bailed him out. With no place to go, Jacob tracks down Alix and her lover and business partner July at their exotic-plant greenhouse, Green Girls. The tension between Alix and July is apparent and Jacob is quickly intrigued by July, the young half-Kogi Indian woman from Colombia whose shaman husband is in jail for biting off her finger. Jacob's desire to be with his son tears at him, and the restraining order keeping him from his wife makes him crazy. He tries to get away, but July and Alix exert a mysterious pull. Finally, Alix summons July and Jacob to the Piscataqua River Bridge-the bridge that separates Maine from New Hampshire-where Jacob watches Alix fall to her death. Though her body isn't found, the police consider Jacob a prime murder suspect. 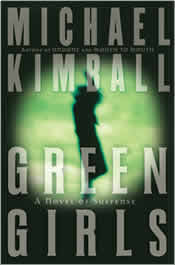 Green Girls is a page-turner. The plot's twists and turns are almost too much, but the characters are intriguing and the suspense complete. Although we know who the antagonist is, the motivation is drawn out until the end. Descriptions of July's Colombia home, the backyard rainforest she and Alix maintain, and the regular appearance of poisonous dart frogs give a sense of strangeness and danger. Michael Kimball's previous novels include Mouth to Mouth, Firewater Pond, and Undone. Portland Monthly recently named Kimball one of "The 10 Most Intriguing People in Maine," where he lives with his family.